Picture taken from Karas Kustoms site. 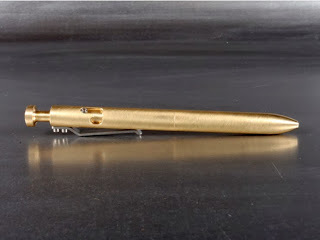 "The Bolt is a machined, bolt-action pen body. It weighs 2.8 ounces and is 5.625" in length (overall). This pen body uses any Parker ballpoint compatible refill (including the Fisher Space Pen refill) and features a stainless clip and hardware. We designed The Bolt to be fun to use and to be extremely durable. This may be the last pen you ever have to buy. Each pen is machined from solid brass, in our shop, right here in the good ol' USA." Today's post is about the pen that I bought recently from Karas Kustoms. Karas Kustoms is well-known for some of their machined pens like Render k, The Bolt, and Retrakt. Those pens are made either in aluminium, brass or copper. Pens made in such materials can sure withstand some heavy duty treatments. Some of the pens were started on KickStarter, and they've got many attentions. I got to know about this pen through some of the users on Field Nuts group on Facebook. All of them have given positive feedbacks about this pen, and it actually got me curious. "What's so good about this pen?" The pen is even featured on Word.Notebooks page! After much researches, I finally purchased The Bolt from HuckBerry. The Bolt comes in 2 pieces, the Top and Bottom. This is the locking mechanism. The clip is removable - Karas Kustoms actually includes a repair-kit in the package. This is how it looks when the ink is locked. The Bolt doesn't come with any ink refill. I removed the Parker ink refill from one of the pens and place it into The Bolt. The Bolt brass is a very heavy pen (about 79.4 gram) compare to the rest I have. It will certainly takes a while before I get use to the weight of the pen. It is a looker - I must admit. (gold is heavy as well). With its bolt-action locking mechanism, I am not afraid that I will accidentally press on the top and leave the tip of the pen expose (especially when I keep the pen into the pocket). With it's unique design, I am not afraid that someone take my pen away by mistake. If you are a pen collector, this is one piece that's worth collecting. The next Karas Kustoms pen I am eyeing at is the Retrakt Aluminum that uses Pilot G2 refill. If you want to know more about Karas Kustoms pens, From the Pen Cup give great details about all their pens.